This past week agents have been calling us asking how we see the local SW Florida real estate market. Agents are complaining that their closings are down in August. This was predictable because recently released data shows SW Florida pending real estate inventory dropped 9.6% in July. July pendings are an indicator of what will close in August and September. 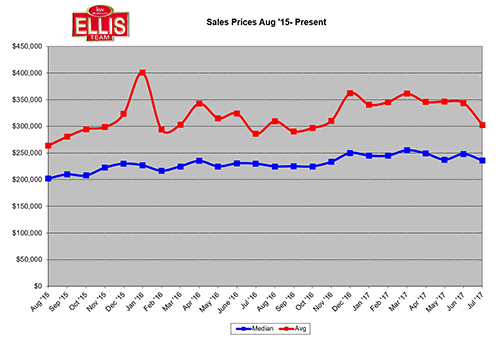 We saw a dip in average and median sales prices in July from June, however median prices were up 2.5% over last July 2016 and average prices were up 5.9%. All year we’ve been tracking homes closed and we’ve said it’s been tracking between 2015-2016 numbers. 2016 closed sales were down against 2015. We are close to tracking down against 2016, and if this occurs we’ll keep an eye out for potential changes in the market. Last year, as evidenced by the graph, sales numbers increased in August, so if July’s pending inventory is an indicator, we might not reach those levels. 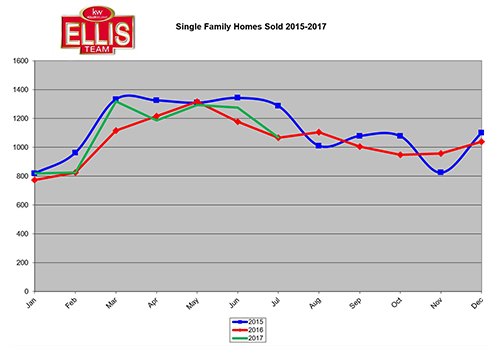 The Ellis Team has sold some quick close cash deals that went pending in mid-August and are scheduled to close at end of August that might add to the July pendings and help, but will it be enough? We’ve been telling sellers throughout the year, now may be a good time to sell. You have less competition from other sellers and interest rates are scheduled to go up as the Fed is pulling back its $4.5 Trillion bond assets. If pending sales continue to decline, it will add to more time on the market. This may be a blip on the map as we’ve recently sold 9 properties in less than 2 weeks. The market could heat up again just like that. As we enter the Fall and Winter, more listings typically enter the market. Sellers will have more competition. Who you choose to market your home will be more important than ever, as marketing matters when inventory rises. If you’re a buyer, you might like to search all the homes for sale at www.LeeCountyOnline.com Our database is updated every few minutes, so it has the latest data. You won’t be frustrated with seeing homes that sold years ago and no longer on the market. If you’re a potential seller, you’ll love the website too as it has Free home valuations in addition to valuable neighborhood data, market reports, and photo galleries of nearby active, pending, and sold properties. There is no substitute for talking with the Ellis Team at Keller Williams Realty, but if you’re going to research on your own, www.LeeCountyOnline.com is your best bet. We have a database of buyers we can search when we list a property. We can then call all buyers that are searching for homes matching that listing. For instance, let’s say we’re listing a property in Paseo. I went into our database and we have 190 leads looking for homes that match Paseo. They might be looking at other areas too, but definitely considering Paseo. We can do this for any neighborhood or price range. Not only do sellers receive benefit of our current marketing, they also get the benefit of our past marketing. For this reason, marketing matters! When you’re interviewing agents to sell your home, ask for detailed marketing plan and how many buyers do they have right now that match your home. This will tell you the marketing muscle they bring to the table. Whether looking to buy or sell, professional advice matters. Always call the Ellis Team at Keller Williams Realty 239-489-4042. We’re here to answer your questions and help you accomplish your goals. Not our goals, your goals. Good luck and enjoy the Labor Day Weekend! Posted in Cape Coral, Cape Coral Real Estate, Fort Myers, Fort Myers Beach, Fort Myers Real Estate, Southwest Florida Real Estate.Tagged SW Florida Pending Real Estate Inventory Drops, SW Florida real estate homes closed.